Introduction: Laparoscopic gastrectomy (LAG) with limited lymph node dissection has been used for the treatment of early gastric cancer as a clinical trial and the number of cases has been increasing. Although, recently, LAG with complete D2 lymph node dissection has been reported, it is usually performed only in experienced institutions and there is little reports considering its technical safety. Methods: Between January 2006 and December 2008, we performed 97 cases of laparoscopic distal gastrectomy(LDG) (D1+beta group; n=65 and D2 group; n=32) and 49 cases of laparoscopic total gastrectomy(LTG) (D1+beta group; n=32 and D2 group; n=17). 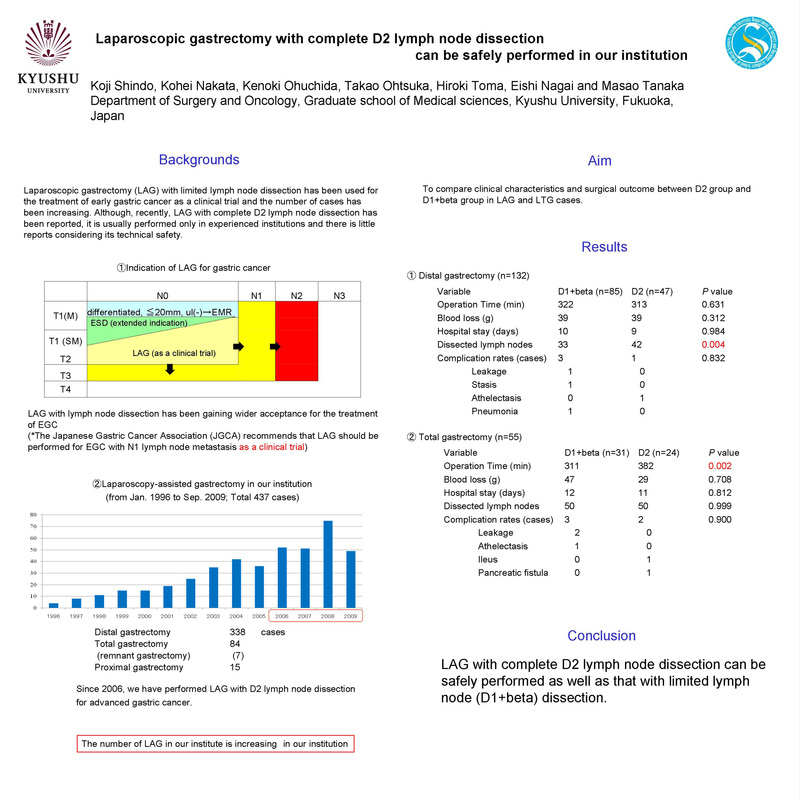 We compared clinical characteristics and surgical outcome between D2 group and D2+beta group in LAG and LTG cases. Results: In LDG cases, there was no significant difference between D1+beta group and D2 group in surgical outcome including operation time (330 min vs 343 min, p =0.25), blood loss (88ml vs 78 ml, p =0.55), complication rates (3.1% vs 0%, p =0.44) and hospital stay (10.8 days vs 10.8 days, p =0.78). On the other hand, in LTG group, operation time was significantly longer in D2 group (421 min) compared with D1+beta group (327 min; p < 0.01). However, there was no significant difference in blood loss (80 ml vs 114 ml, p =0.74), complication rates (9.4% vs 11.7%; p =0.78) and hospital stay (15.3 days vs 15.0 days, p =0.14). Conclusions: LAG with complete D2 lymph node dissection can be safely performed as well as that with limited lymph node (D1+beta) dissection.